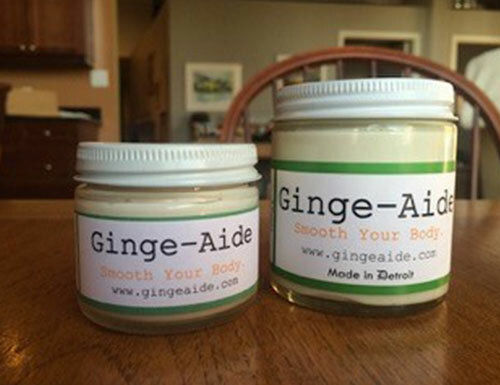 Ginge Aide is a Detroit company that sells all natural hand cream, foot cream, and body cream. Customer testimonials include claims of soothing everything from eczema to diabetic neuropathy. We talked to Ginger Quinn, who founded the company in 2011. What inspired you to found Ginge Aide? As a professional cosmetologist with eczema, my hands became cracked and distressed from the use of chemicals in my daily work. I decided to do something about it and researched ingredients and began my experiment. I landed on a formula and created a hand cream, and after ten days of treatment my skin was smooth and clear. Shea butter is the base of the hand cream and foot cream, paired with avocado and grape seed oil. The hand cream also contains ginger and geranium, and the foot cream also has peppermint and marjoram components. The body cream has a coconut base with lemon grass in it. We sell our products directly through our website (www.gingeaide.com) and at the Eastern Market. It’s our third year there. You can find my husband, Tim selling our products there on Saturdays. Our products also can be purchased through five local distributors: Exodus Nail and Hair Salon, St. Clair Shores (the salon where I work); TEASE Salon, Clawson; Urban Attic Artful Gifts, St. Clair Shores; Tootie and Tallulah’s, Berkley; Skyetique Boutique & Beauty Bar, Grosse Pointe Park; and JJ’s Hair in Ohio and Indiana. How do you want your company to impact Detroit in the long term? I want to keep growing my business here in the city. Currently my family and I make Ginge Aide products out of our home; my brother designed the logo and my husband helps sell our products. I’m on the path to begin mass distribution and my goal is to stay in Detroit while that happens. Additionally, I want to continue to support and become more involved with local causes in Detroit. We donate 10 percent of our profits from Ginge Aide to multiple nonprofits throughout the city. Long term, I’d love to approach like-minded retailers in Detroit such as Whole Foods and perhaps local boutiques and hotels to sell our products. What companies have you collaborated with in Detroit as customers or suppliers? Eastern Market Corporation has been such an amazing partner and resource by providing a place for us to sell our product. I’m looking forward to continuing to partner with other Detroit resources as Ginge Aide continues to expand through the help of Eastern Market Corporation and DEGC.